EXCLUSIVE: Married at First Sight's Elizabeth: "I love guys with face tatts"
Does this bride’s groom meet her unusual needs? Elizabeth Sobinoff is without a doubt the most polarising bride on the new season of Married at First Sight. And OK! can exclusively confirm there's more to this confident and unlucky-in-love beauty than meets the eye. A self-confessed lover of Stepford wife-style (pearls included), Liz has a thing for Mick Jagger and Keith Richards, both 75. It's no surprise that Elizabeth loves a tattoo, in fact, the store manager has some pretty cool tatts herself. And when it comes to her men - she just can't get enough of them - especially when they're covered in the inky art! "I tend to go for guys with tattoos. I actually love guys with facial tattoos. I've dated guys that are completely tattooed, including facial tattoos. I like different people. I don't judge people on their appearance," she says. When it comes to her own body, Elizabeth wants to get more! "I have a spiritual side to me and all my tattoos represent that," she said. "Next I want a black widow spider, and from my rib cage to my knees tattooed. But I don't want any more on my arms or calves. I like to be different and eccentric and I don't apologise for that. "I'm allergic to the sun!" While Elizabeth loves to show off her incredibly figure, you won't see her posting many photos while lying about in the sunshine. "I have an autoimmune condition. I love the beach, but if I'm going to go, I know that for two weeks after I'm not going to be so well," she reveals. "I'm basically allergic to the sun. I get burns on my body. I also have a really photosensitive scalp and ears, so I get a rash, which is why I wear hair extensions to act as a hat." The hair extensions have become one of her trademark features, but up until just a few months ago, Elizabeth looked completely different. A cheeky deep dive into Elizabeth's Instagram account reveals she was rocking very dark brown hair as early as June last year. Even when she was a brunette, Elizabeth was still sporting her signature thick brown eyeliner and overdrawn, pouty lipstick. 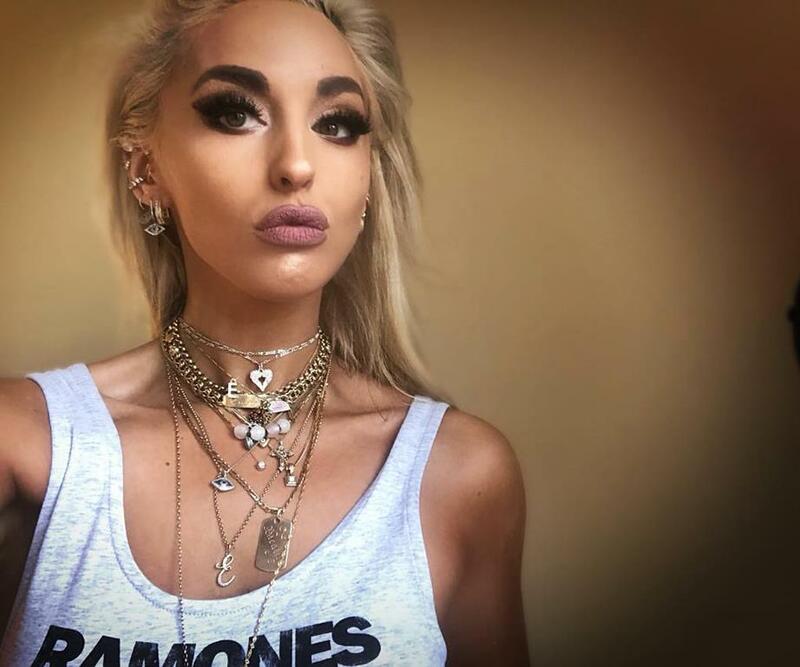 Her followers are constantly treated to sultry selfies and bikini shots, and she is never not wearing a collection of gold chains around her neck. Dubbed "Australia's most confident bride", Elizabeth is set to ruffle feathers on the show with her overconfident personality. So will the MAFS experts get it right? For more Married at First Sight 2019 gossip and exclusives, pick up a copy of this week's OK! magazine.